The Daily Rant: Is The Coast Clear Yet? 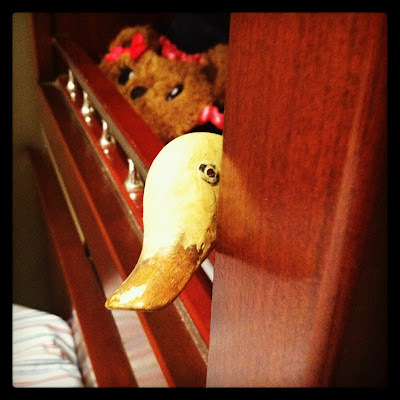 The duck peeks out from the bookshelf, wondering if the Christmas decorations cluttering his area have come down yet. We have another week or so before we go home, which is when I'll take down the Christmas decorations and store them in the shed. Until then, you've just gotta live with it. Your duck is peeking out because he's Russian Orthodox (freedom of choice on your truck), and he's saying "Salena. Where is my feast?" RO Christmas is January 7, so you have a day to prepare your duck (and his companions) a feast.